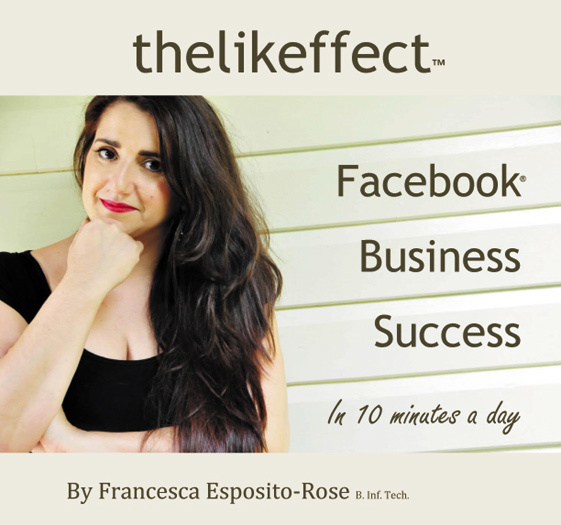 thelikeffect™ is a highly successful 10-step method that equips you with an action plan that works for any business model and partners perfectly with your current marketing strategy. It also teaches you exactly how to manage your business on Facebook efficiently and successfully and also teaches you the skills to do this in 10 minutes a day. It’s been designed as a “How To” manual for businesses with guided help and examples every step of the way; however it’s a great tool for Social Media Optimisers as well. For SMO’s, the robust Vertical and Horizontal Methodology will have you mastering the ropes quickly and easily. thelikeffect™ is jam-packed with first hand experiences, real companies, real examples and compelling insights into the psychology behind Social Media. This book takes you behind the scenes and shows you powerful statistics that will prove, without a doubt, that you need Facebook for your business. It will also show you why “Like” is the new currency and what you need to do to make your business flourish and thrive right now.